Rooks are gregarious, feeding and nesting in colonies whereas Crows are usually seen only in ones or pairs. It’s not always the case – Crows certainly nest singly but I have seen 60 Crows on Parker’s Piece after the summer fair in 2016 searching for dropped foods – probably the entire City’s population of Carrion Crows. Rooks are birds of Western Europe, of pastures and arable, where they hunt for leather jackets, molluscs and, to the dismay of farmers, germinating seedlings. Crows have become much more common, probably due to less persecution, and are efficient feeders on roadside carrion and discarded take-aways! Rookeries usually comprise 20-30 active nests and have often been established for many years; some are centuries old and can be signifiers of ancient woodland. The NatHistCam project is collecting records of active Rookeries with the project area – there are probably only 2-3 rookeries in the City. To add to the confusion of the large black crows Ravens are now moving east! They have been seen just outside the project area over Impington and are now nesting in the west of the County. They have a distinctive call – a deep cronking “prunk, prunk…..” . They are usually only seen singly or in pairs. 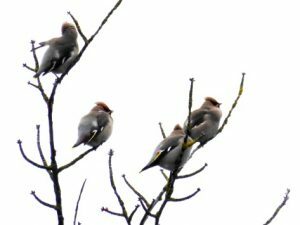 A group of up to 15 Waxwings feeding on rose hips and mistletoe berries next to the guided bus stop opposite the Vindis garage on Milton Road have entertained many birders. Another small group have been seen in Sable Way, Cherry Hinton. An exceptional winter visitor to the City has been a female (ring-tail) Hen Harrier hunting over land set-aside for development by the Huntingdon Road – Histon Road footpath in the north of our project area.